This photo is circa 1904, via the Library of Congress. And a new term for the building, too? 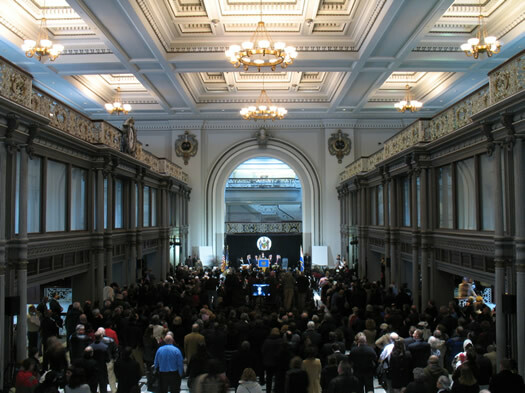 One more pic from Wednesday's Albany inaugural ceremony at KiernanPlazaNanoCollegeSmartCityThingStation, though it's really more of the building than the ceremony. As you know, Kiernan Plaza is the former Albany train station, and it's now part of the NanoCollege -- slated to become the "Smart Cities Technology Innovation Center." The announced tenants so far are: SEFCU, the engineering firm CHA, and Windstream (a telecom company). Anyway, it's a beautiful building. And every time we get a chance to gawk at the inside, we wish there could be a way to open it up to the public more often -- either for events or some sort of other use. Maybe someone can leverage some synergies to make that happen. Here's what the interior of the station looked like in the 1930s, via the Albany Group Archive on Flickr. After the jump: The photo above, in large format. 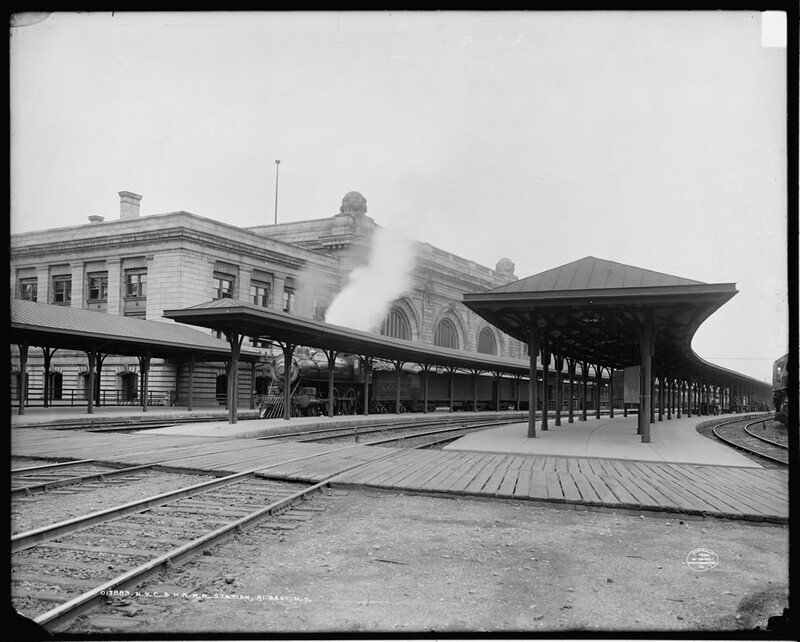 And a circa 1904 exterior photo of the station. Photos are in large format above -- click or scroll all the way up. I truly hope that all of the institutional partners investing (money, time and effort; whether in equal parts remains to be seen) in the Kiernan Plaza really pull this off and that it doesnâ€™t flounder like some of the other â€œflashyâ€ projects that promise to build Albanyâ€™s tax base and support the movement of middle class families into the city of Albany. The idea of a â€œSmart Cities Technology Innovation Centerâ€ harnessing the 21st centuryâ€™s leading ideas and theories and applying those to the city of Albanyâ€™s municipal operations and functions (with the hope that city residents can also get paid from these endeavors) sounds incredibly intriguing and right up my own personal alley. However, as the TUâ€™s Chris Chruchill points out (http://www.timesunion.com/default/article/Symbolism-strong-at-Kiernan-Plaza-event-5107370.php), the current roster of companies moving in have dubious connections to this goal and get back to my original fear of more companies utilizing tax payer backed property (at the expense of the city) to relocate, with limited benefit to the city itself. Iâ€™ll give this time and I am fairly optimistic, but now that we are four months out from the announcement of this initiative Iâ€™m really disappointed that the institutional partners have failed to establish even a basic website. At the very least, some explanation of the mission and partners would be helpful, and ideally an account of the short and long term goals and objectives. This will allow the public and the residents of the city of Albany to hold these partners accountable and provide our own effort and energy into making this a success story for the city and region. After all, a lot of our money is on the hook!